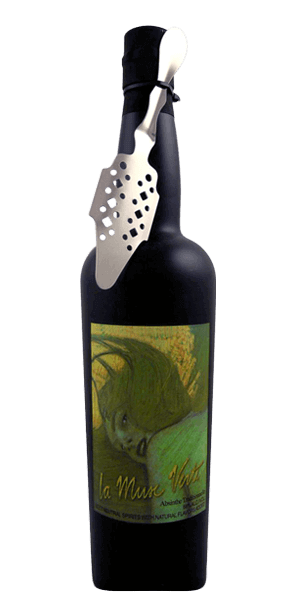 La Muse Verte makes an inspiring presentation in the glass and on the tongue. The Artez Distillery sits in the heart of the Gascony region — a largely agricultural area on the northwest coast of France, bordering Spain on one side and the Cognac region on the other. They have produced Armagnacs at Artez for generations and still produce a wide range of similar spirits under the Artez label. When they discovered that the excess Eau de Vie left over from the Armagnac production was ideally suited to the creation of other premium spirits, they soon expanded their offerings across a broad assortment of specialty infused and aged spirits. “La Muse Verte” translates literally and figuratively to “the green inspiration.” Isn’t that just about the coolest name for Absinthe ever? Several years ago the Artez Distillery acquired the classic La Muse Verte brand and formulation from the Berneau Family that had produced it in the 1800s. It’s hard to over-use the word “classic” when describing it. Like all green Absinthes, the herbs — in this case wormwood, star anise, and fennel — are macerated and infused after distillation allowing the natural green color to remain. It makes an inspiring presentation in the glass and on the tongue. Smartass Corner: Many Absinthes demonstrate the “Louche Effect” (sometimes called the “ouzo effect”). Common in quality anise-flavored liquors, if cold water is added to a clear liquor containing anise, the liquid will immediately turn milky in the glass as the hydrophobic essential oils emulsify. What does La Muse Verte Absinthe taste like? The Flavor Spiral™ shows the most common flavors that you'll taste in La Muse Verte Absinthe and gives you a chance to have a taste of it before actually tasting it. Knew it would be licorice flavor but thought it would be slight. It is overpowering. If you like black licorice get this. If you don't yuck. Strong aroma/taste of Licorice, overwhelming at first. Smooth and sweet taste that lingers long after drinking. a classic complex sweet herbal apéritif / cordial with a harmonious finish.